She shook her head no, and now CNN is shaking its head yes. 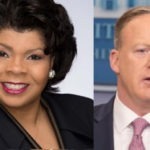 Just days after American Urban Radio reporter April Ryan faced off with White House Press Secretary Sean Spicer in a controversial briefing room exchange which made headlines, she’s being hired to a more prominent job. CNN’s Brian Stelter has announced that his network is hiring her.